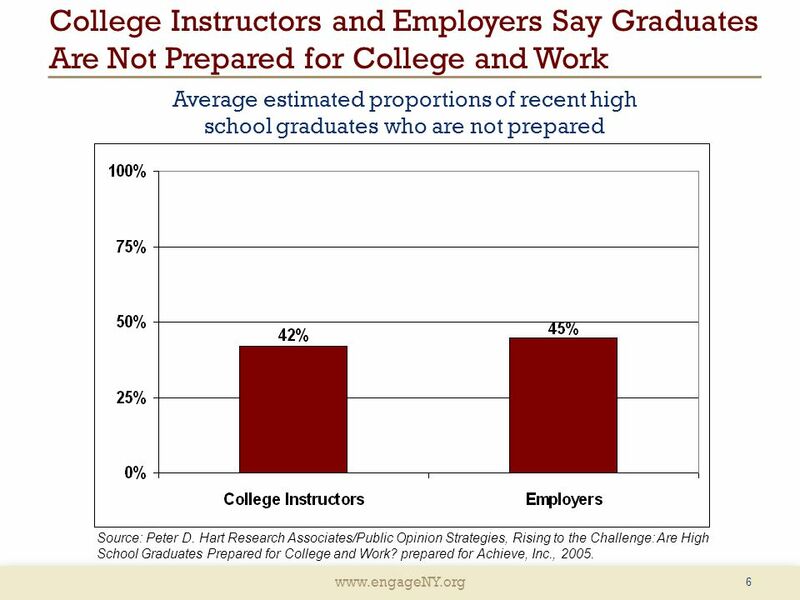 6 www.engageNY.org 6 College Instructors and Employers Say Graduates Are Not Prepared for College and Work Average estimated proportions of recent high school graduates who are not prepared Source: Peter D. Hart Research Associates/Public Opinion Strategies, Rising to the Challenge: Are High School Graduates Prepared for College and Work? prepared for Achieve, Inc., 2005. 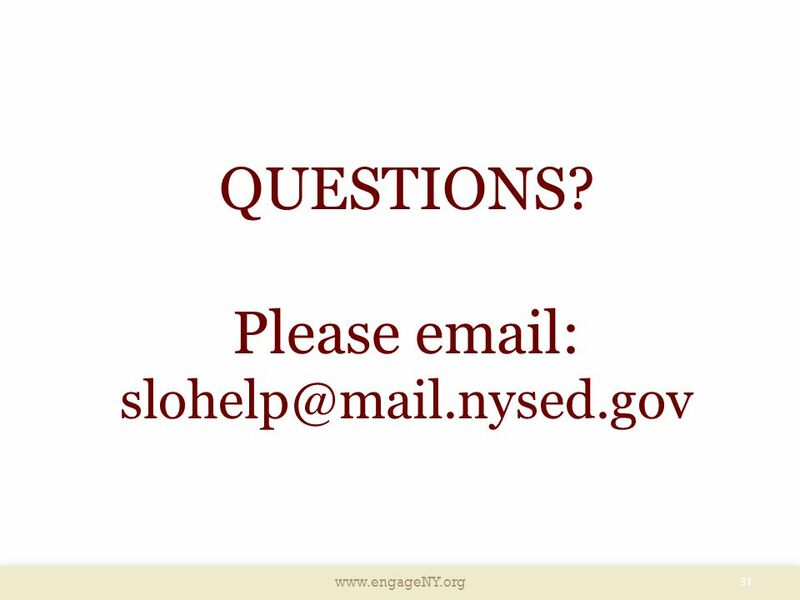 8 www.engageNY.org SLOs Focus Attention on Essential Learning, Data, and Outcomes September/October November/December January/February March/April May/June What is the aggregate of what my students will learn this year? 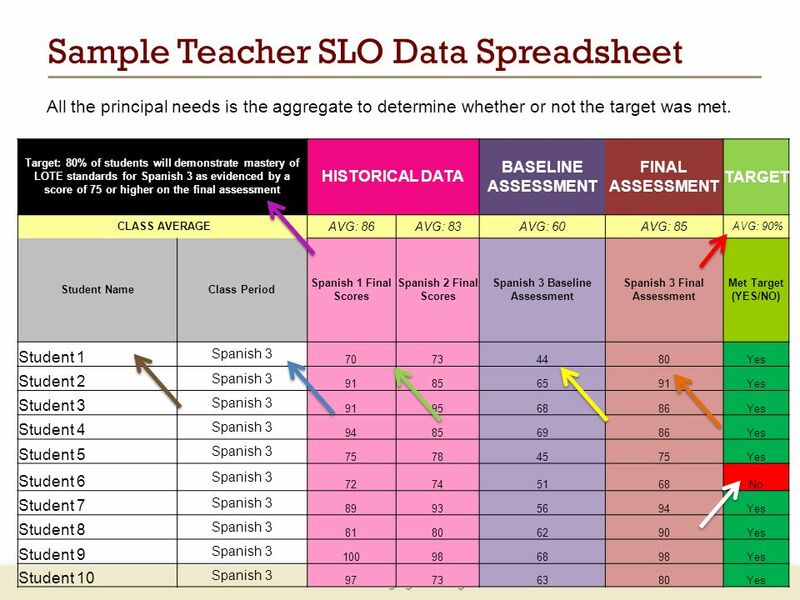 10 www.engageNY.org Target: 80% of students will demonstrate mastery of LOTE standards for Spanish 3 as evidenced by a score of 75 or higher on the final assessment HISTORICAL DATA BASELINE ASSESSMENT FINAL ASSESSMENT TARGET CLASS AVERAGE AVG: 86AVG: 83AVG: 60AVG: 85 AVG: 90% Student NameClass Period Spanish 1 Final Scores Spanish 2 Final Scores Spanish 3 Baseline Assessment Spanish 3 Final Assessment Met Target (YES/NO) Student 1 Spanish 3 70734480Yes Student 2 Spanish 3 91856591Yes Student 3 Spanish 3 91956886Yes Student 4 Spanish 3 94856986Yes Student 5 Spanish 3 75784575Yes Student 6 Spanish 3 72745168No Student 7 Spanish 3 89935694Yes Student 8 Spanish 3 81806290Yes Student 9 Spanish 3 100986898Yes Student 10 Spanish 3 97736380Yes Sample Teacher SLO Data Spreadsheet All the principal needs is the aggregate to determine whether or not the target was met. 11 www.engageNY.org Key Messages for Student Learning Objectives  SLOs name what students need to know and be able to do by the end of the year. 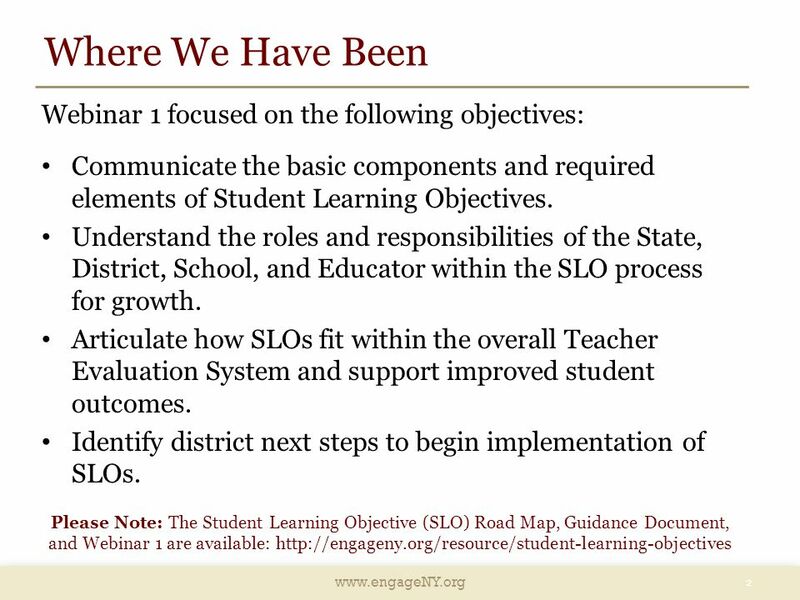  SLOs place student learning at the center of the conversation. 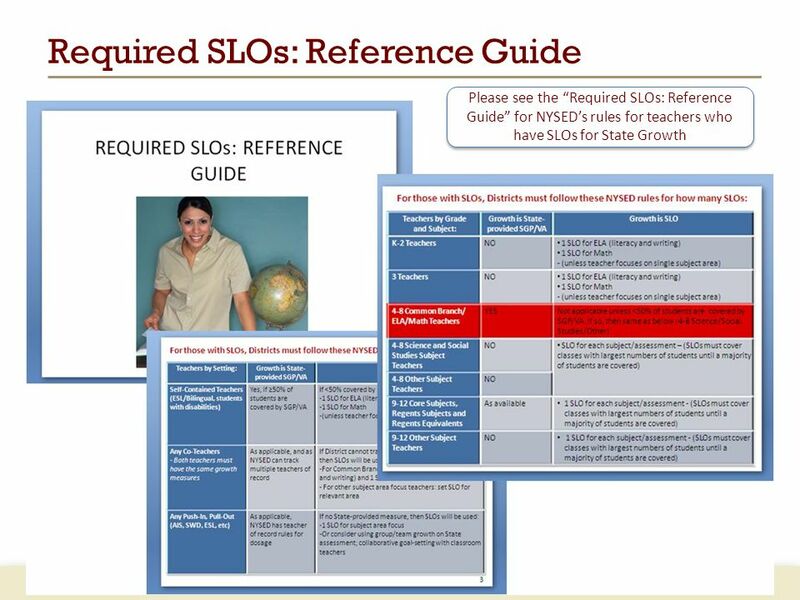  SLOs are a critical part of all great educators’ practice. 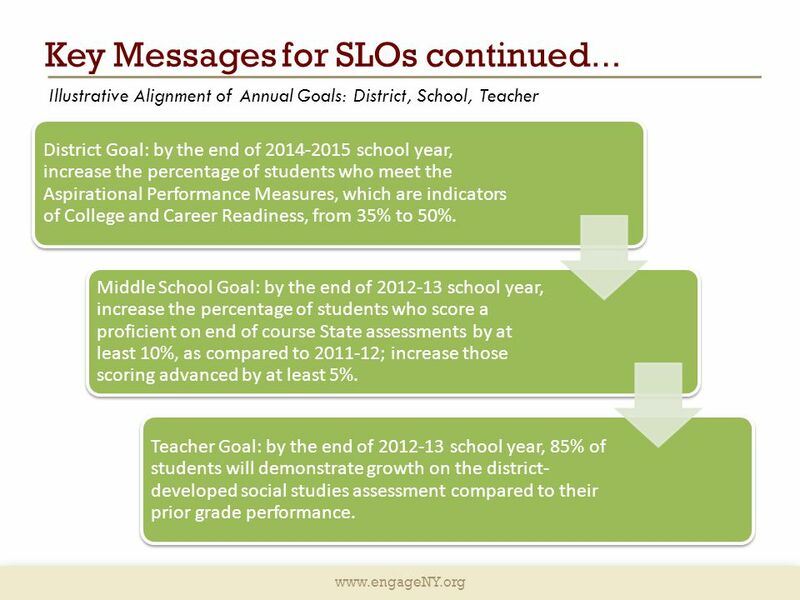  SLOs are an opportunity to document the impact educators make with students. 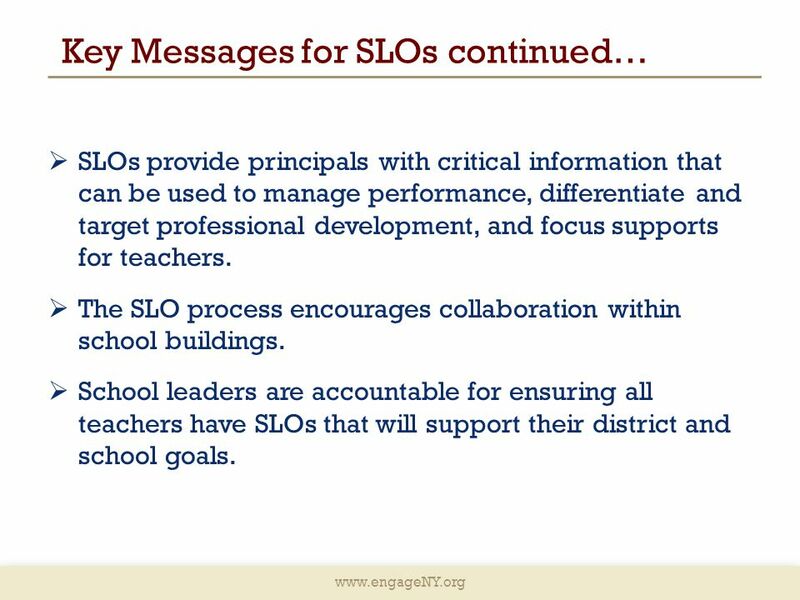 12 www.engageNY.org Key Messages for SLOs continued…  SLOs provide principals with critical information that can be used to manage performance, differentiate and target professional development, and focus supports for teachers.  The SLO process encourages collaboration within school buildings. 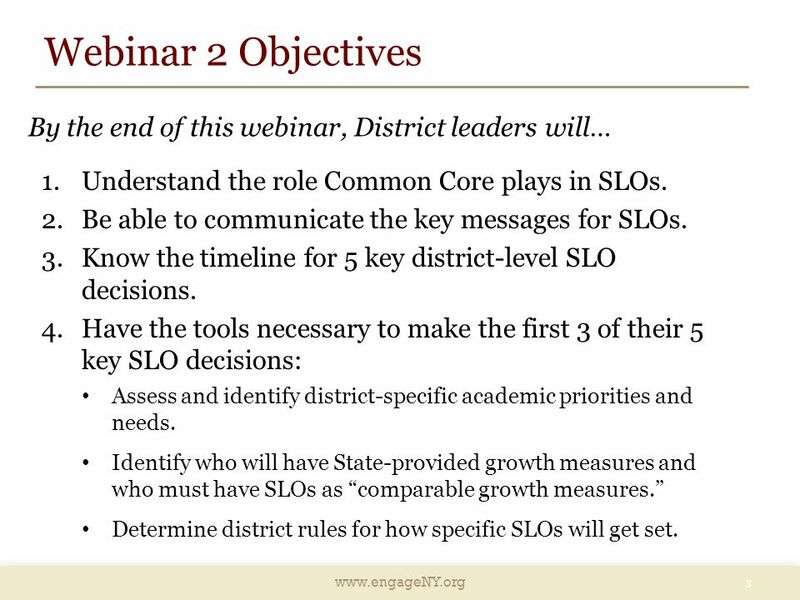  School leaders are accountable for ensuring all teachers have SLOs that will support their district and school goals. 17 www.engageNY.org Step 1. 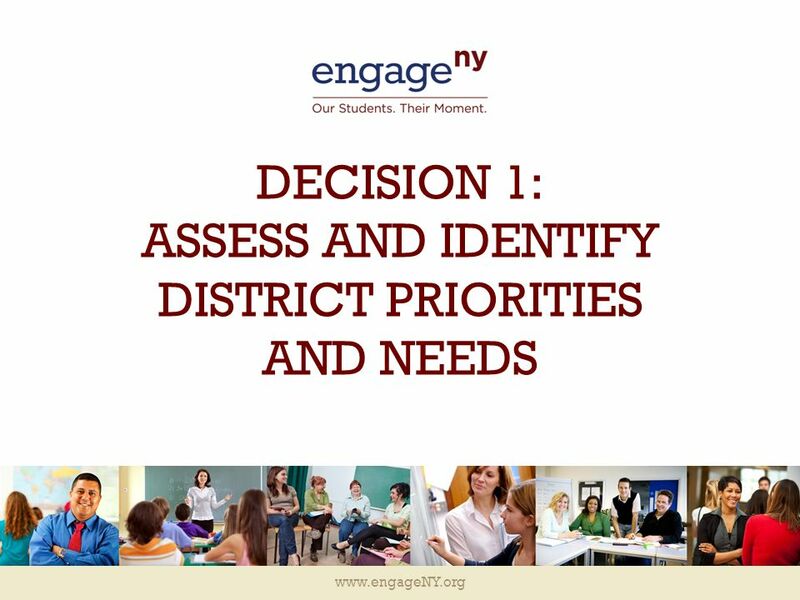 District Leaders Assess and Identify Priorities and Needs* What are the District’s overall priorities, needs, and long-term goals? 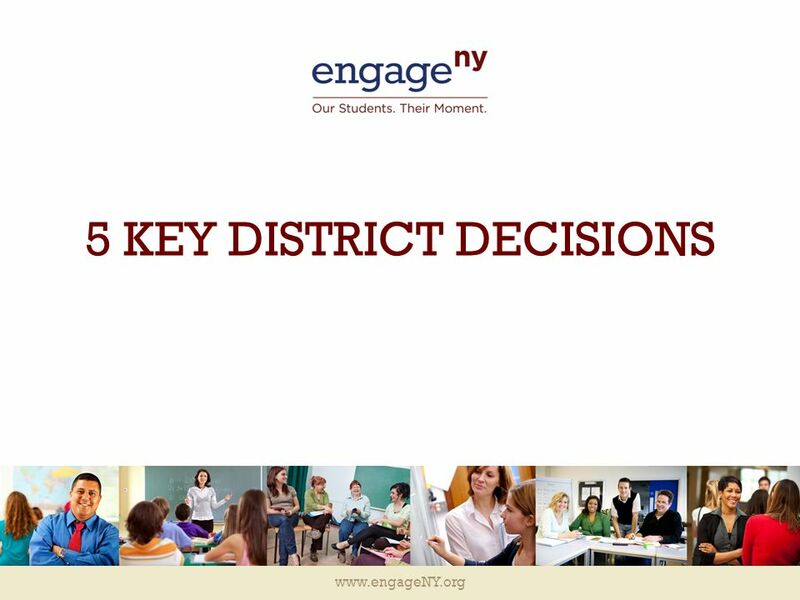 HINT: refer to your district strategic plans, and ensure alignment to the Common Core. HINT: remember that principals and teachers will be held accountable to goals aligned with the district’s stated priorities. 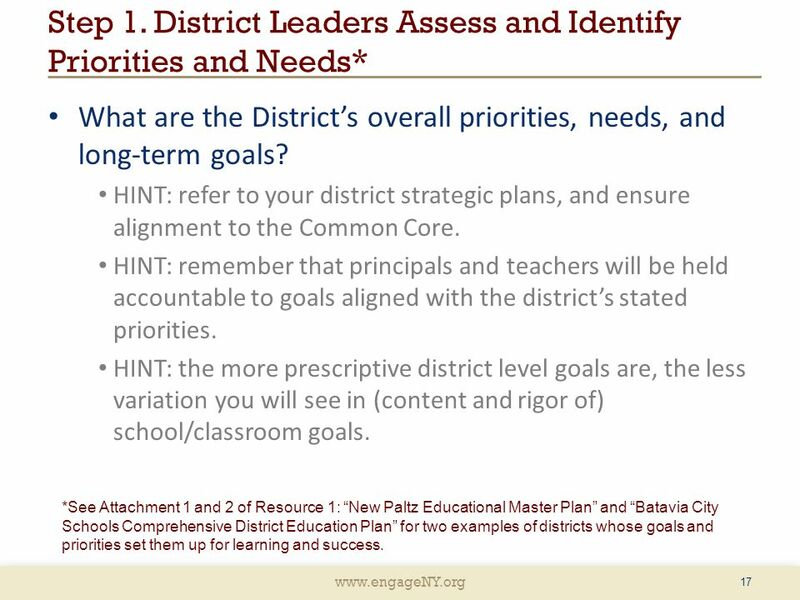 HINT: the more prescriptive district level goals are, the less variation you will see in (content and rigor of) school/classroom goals. 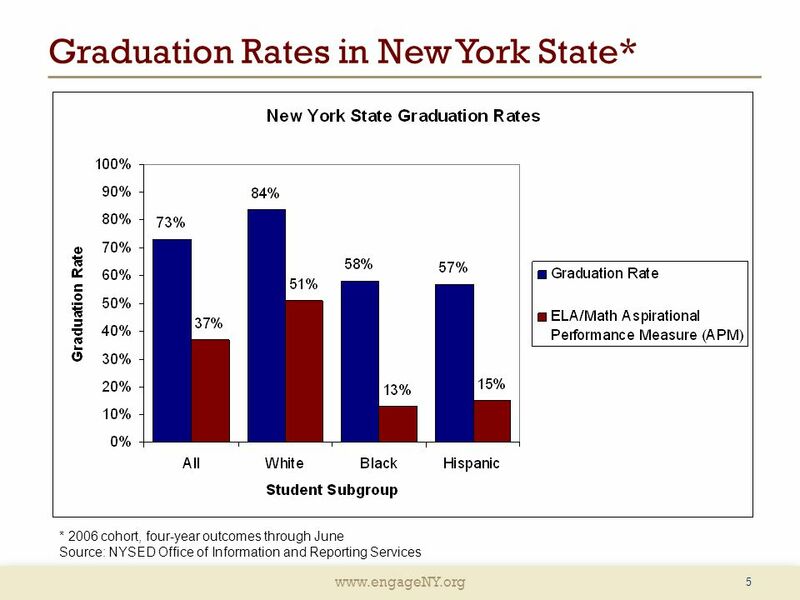 17 *See Attachment 1 and 2 of Resource 1: “New Paltz Educational Master Plan” and “Batavia City Schools Comprehensive District Education Plan” for two examples of districts whose goals and priorities set them up for learning and success. 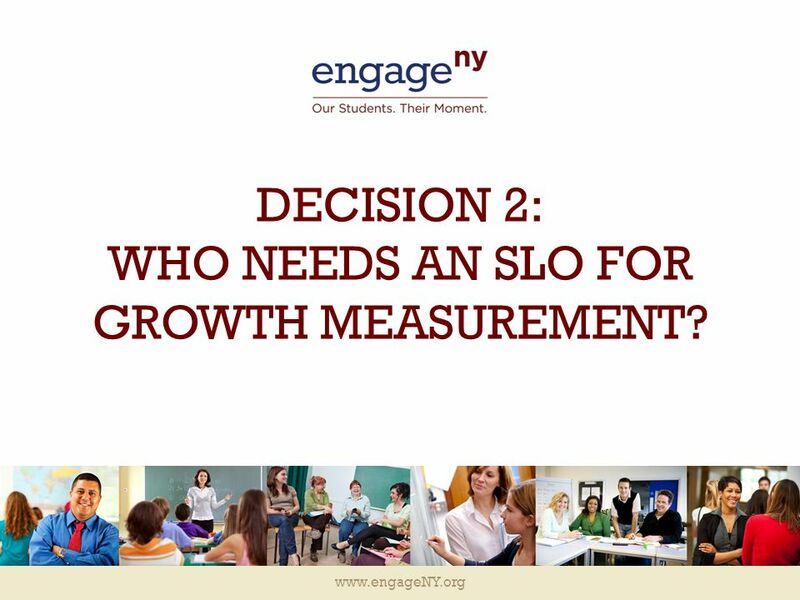 18 www.engageNY.org DECISION 2: WHO NEEDS AN SLO FOR GROWTH MEASUREMENT? 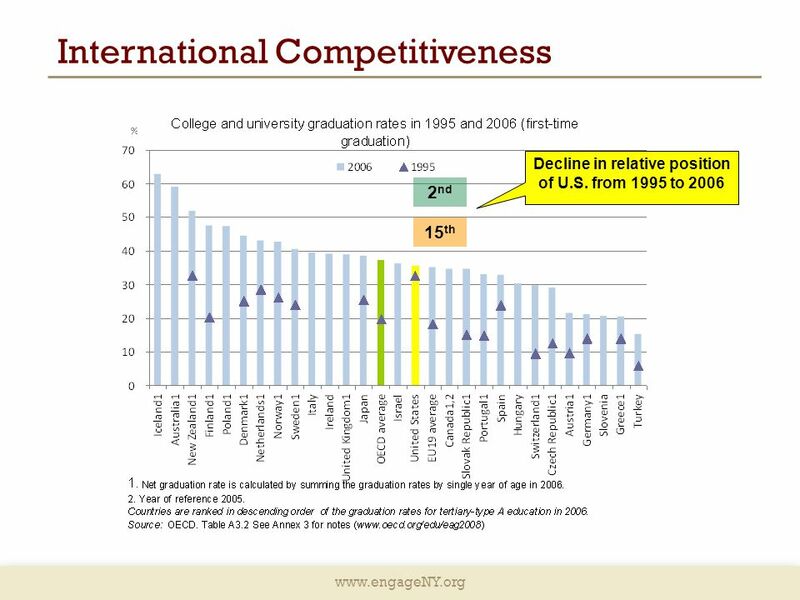 21 www.engageNY.org Test Your Knowledge: State Provided Growth Measure or SLO? 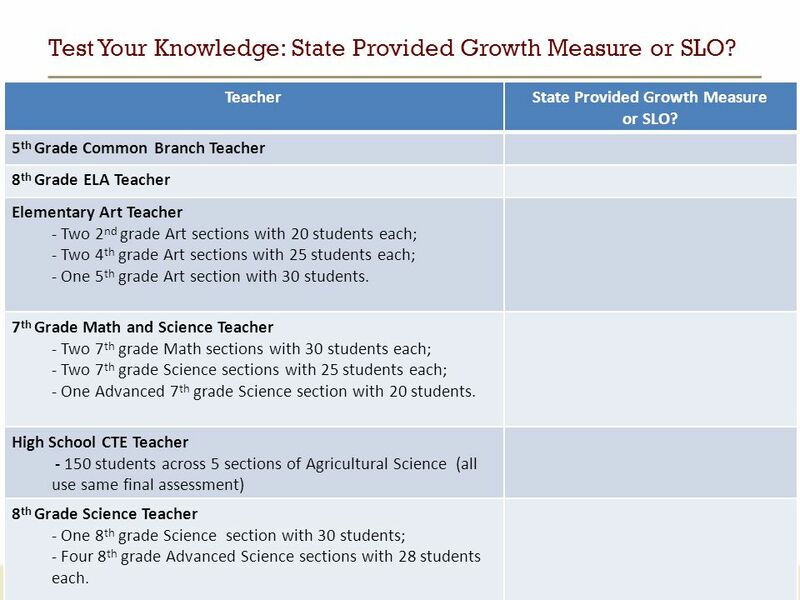 21 TeacherState ProvidedGrowth Measure or SLO? 5 th Grade Common Branch Teacher 8 th GradeELA Teacher ElementaryArt Teacher -Two 2 nd grade Art sections with 20 students each; -Two 4 th grade Art sections with 25 students each; -One 5 th grade Art section with 30 students. 7 th Grade Math and Science Teacher -Two 7 th grade Math sections with 30 students each; -Two 7 th grade Science sections with 25 students each; -One Advanced 7 th grade Science section with 20 students. HighSchool CTE Teacher -150 students across 5 sections of Agricultural Science (all use same final assessment) 8 th Grade Science Teacher -One 8 th grade Science section with 30 students; -Four 8 th grade Advanced Science sections with 28 students each. Test Your Knowledge: State Provided Growth Measure or SLO? 22 www.engageNY.org Test Your Knowledge: State Provided Growth Measure or SLO? 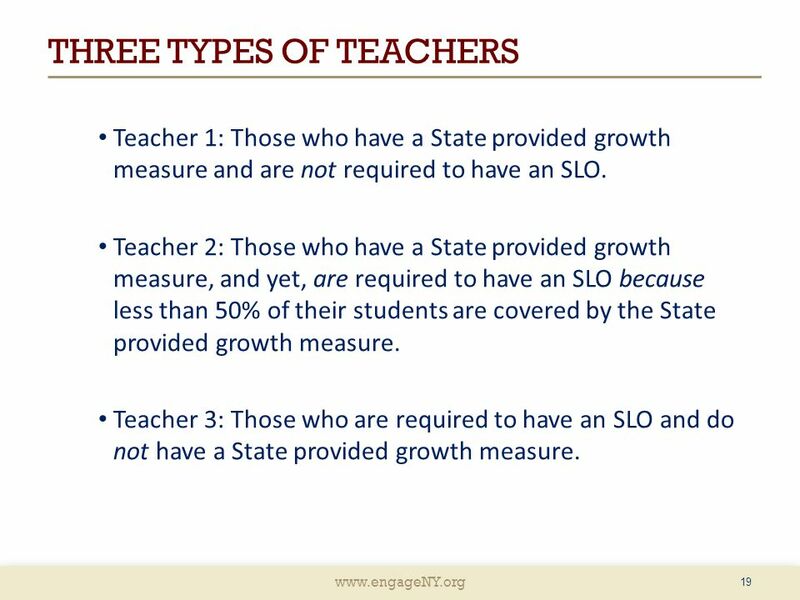 22 TeacherState ProvidedGrowth Measure or SLO? 5 th Grade Common Branch TeacherGrowth SGP/VA 8 th GradeELA TeacherStateProvided Growth SGP/VA ElementaryArt Teacher -Two 2 nd grade Art sections with 20 students each; -Two 4 th grade Art sections with 25 students each; -One 5 th grade Art section with 30 students. SLO: 1 SLO for 4 th grade Art sections 1 SLO for 2 nd grade Art sections 7 th Grade Math and Science Teacher -Two 7 th grade Math sections with 30 students each; -Two 7 th grade Science sections with 25 students each; -One Advanced 7 th grade Science section with 20 students. HighSchool CTE Teacher -150 students across 5 sections of Agricultural Science (all use same final assessment) SLO: 1 SLOfor Agricultural Science sections 8 th Grade Science Teacher -One 8 th grade Science section with 30 students; -Four 8 th grade Advanced Science sections with 28 students each. 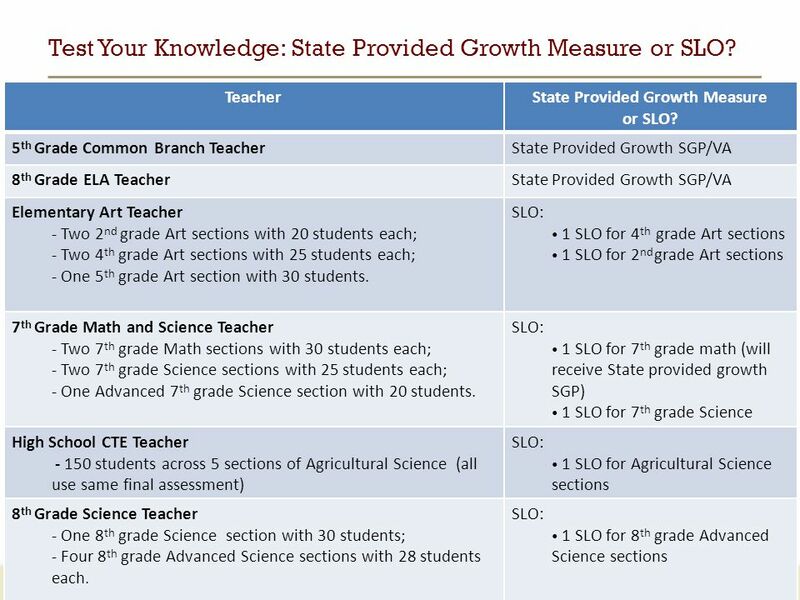 SLO: 1 SLO for 8 th grade Advanced Science sections State Provided SLO: 1 SLO for 7 th grade math (will receive State provided growth SGP) 1 SLO for 7 th grade Science Test Your Knowledge: State Provided Growth Measure or SLO? 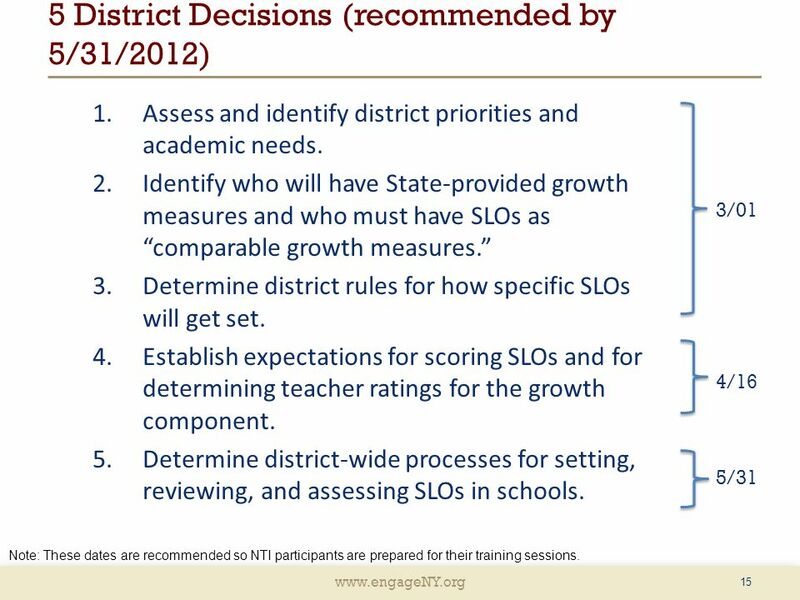 23 www.engageNY.org DECISION 3: HOW WILL SLOs GET SET? 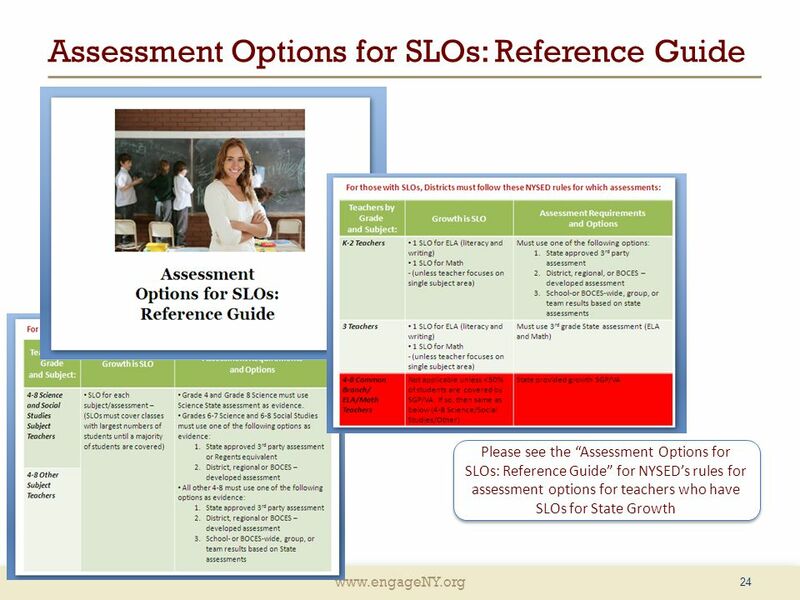 25 www.engageNY.org Teacher Assessment ScenarioDistrict Decision Points Scenario 1: Teacher’s course ends in a State assessment, but teacher is still required to have an SLO (see Teacher 2 and some Teacher 3 on Slide 19). 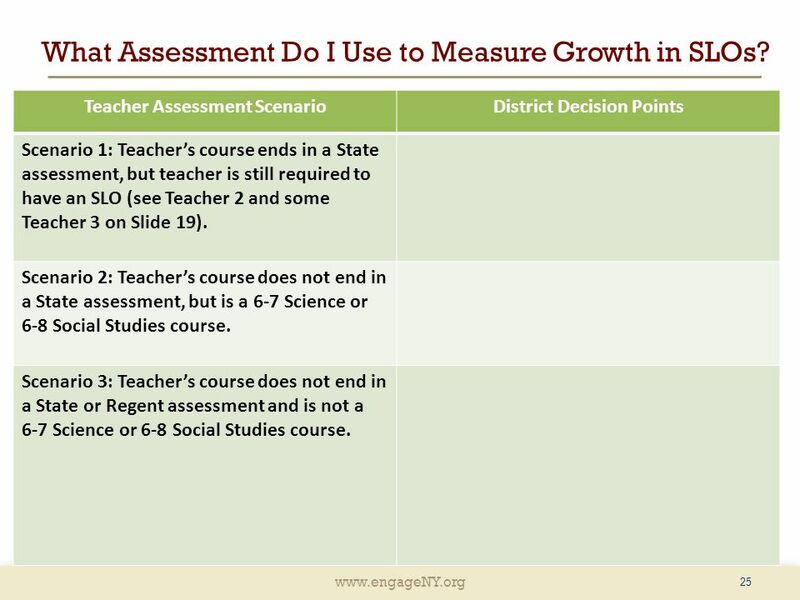 Scenario 2: Teacher’s course does not end in a State assessment, but is a 6-7 Science or 6-8 Social Studies course. Scenario 3: Teacher’s course does not end in a State or Regent assessment and is not a 6-7 Science or 6-8 Social Studies course. 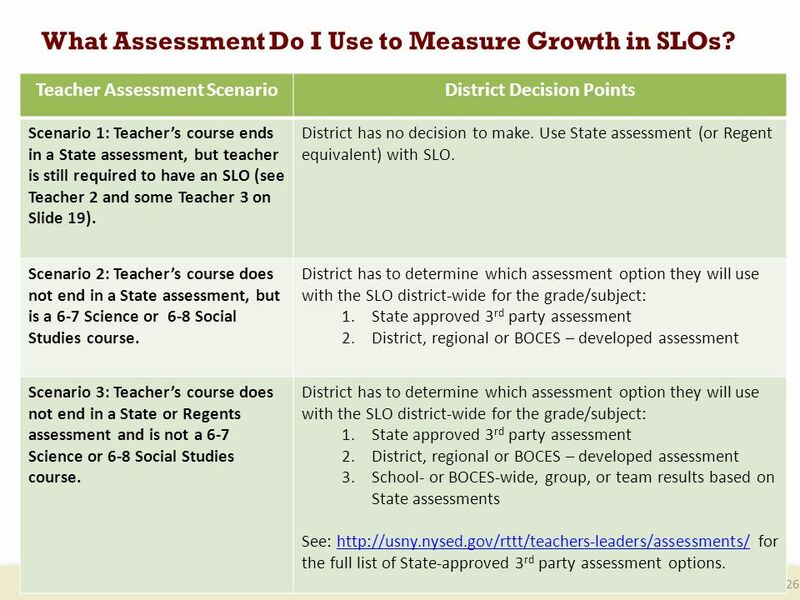 25 What Assessment Do I Use to Measure Growth in SLOs? 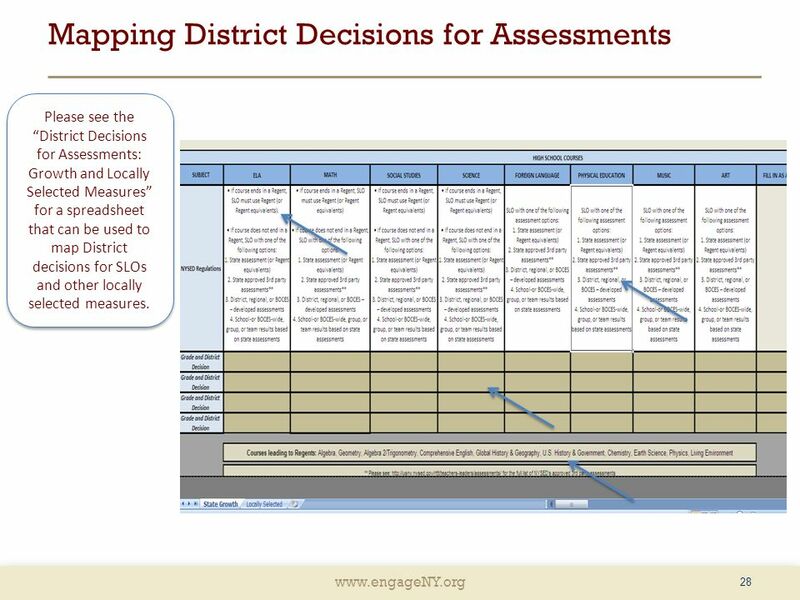 27 www.engageNY.org Mapping District Decisions for Assessments 27 Please see the “District Decisions for Assessments: Growth and Locally Selected Measures” for a spreadsheet that can be used to map District decisions for SLOs and other locally selected measures. 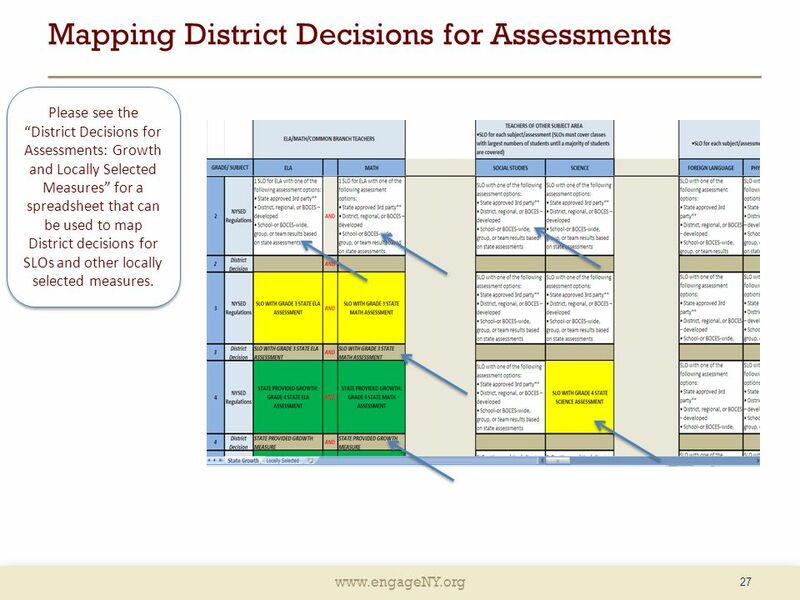 28 www.engageNY.org Mapping District Decisions for Assessments 28 Please see the “District Decisions for Assessments: Growth and Locally Selected Measures” for a spreadsheet that can be used to map District decisions for SLOs and other locally selected measures. 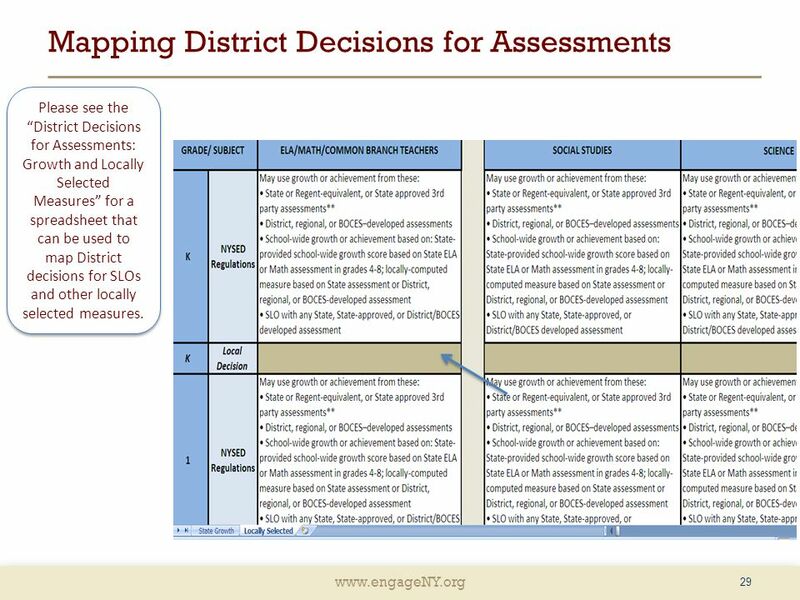 29 www.engageNY.org Mapping District Decisions for Assessments 29 Please see the “District Decisions for Assessments: Growth and Locally Selected Measures” for a spreadsheet that can be used to map District decisions for SLOs and other locally selected measures. 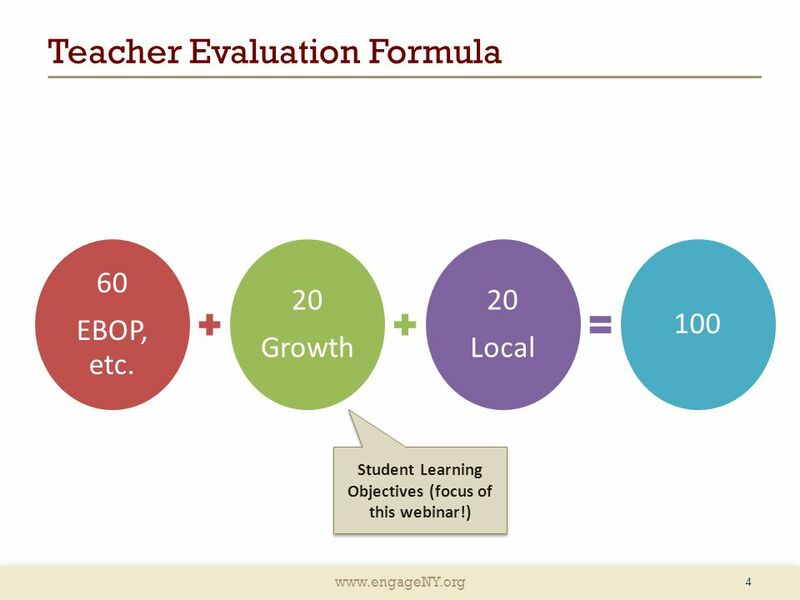 Download ppt "Www.engageNY.org New York State District-wide Growth Goal Setting Process: Student Learning Objectives Webinar 2 (REVISED FEBRUARY 2012)"
1 New York State Education Department Interpreting and Using Your New York State-Provided Growth Scores August 2012. 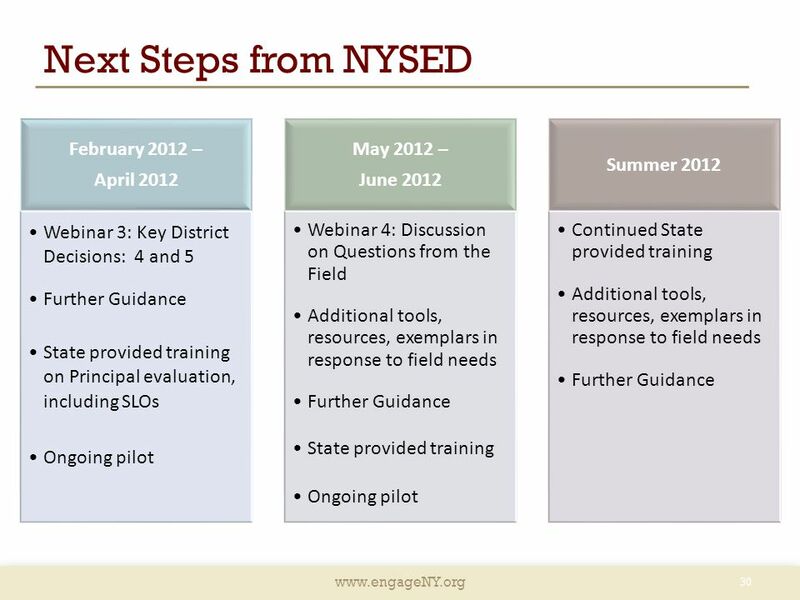 Student Learning Objectives NYS District-Wide Growth Goal Setting Process December 1, 2011 EVOLVING.